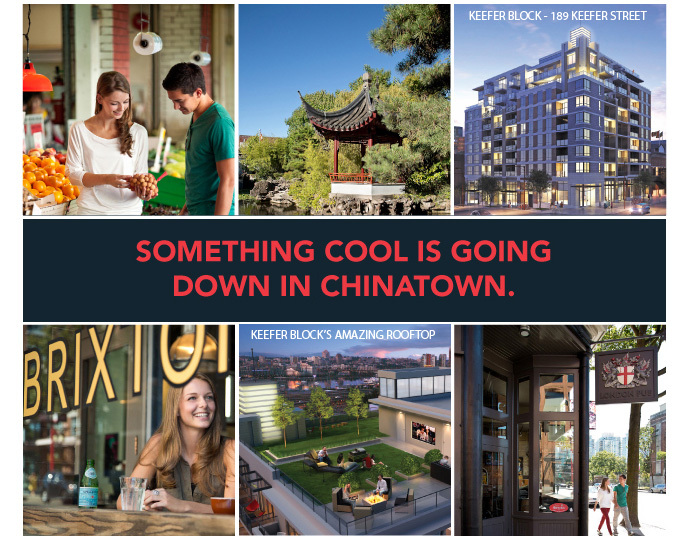 Where HERITAGE meets MODERN > The Chinatown Vancouver KEEFER BLOCK condos are coming Fall 2012. A fine collection of 1, 2 and 3 bedroom modern flats in the ultra popular and quickly changing Chinatown Vancouver Downtown real estate market will be launched by Solterra Development at 189 Keefer Street Vancouver and will be called the KEEFER BLOCK Apartments. The project is located at the corner of Keefer Street and Main Street in historic Chinatown, an area that is undergoing an urban renewal and quick redevelopment with new retail, commercial and residential projects. Interest in the pre-construction Vancouver Keefer Block Condos is growing. Located on the corner of Keefer and Main Street in Historic Chinatown – the epicentre of cultural diversity and neighbourhood revitalization – a new Keefer Block Vancouver Downtown condo community emerges that juxtaposes the honest traditional architecture of the past with remarkable modern design of today. At Keefer Block Vancouver Chinatown Condos, you are just steps away from Bao Bei Restaurant, The Keefer Hotel & Bar, Brixton Café, Spencer Interiors, and the night market. Built by award-winning Solterra, each of the 81 new Vancouver Keefer Block Apartment residences – studios, 1, 2 & 3 bedrooms – will showcase the best of European finishes and design sensibility. Your registration is important and we will continue to keep you regularly updated on the progress of this exciting new Vancouver Chinatown real estate community. Register today for more information at www.keeferblock.com. 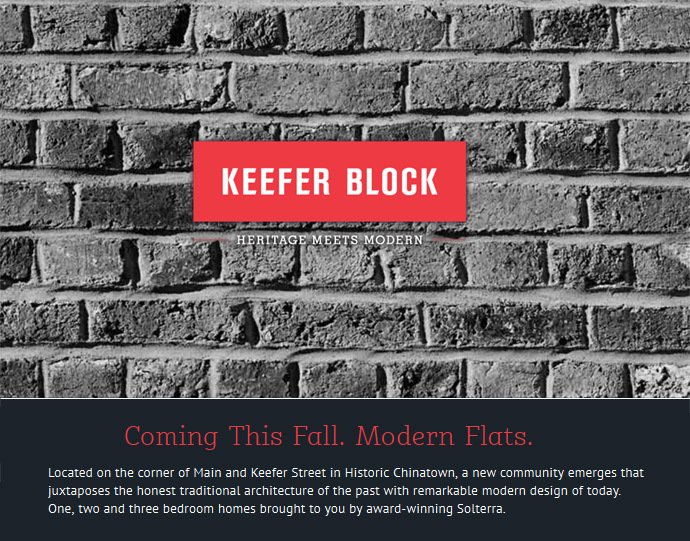 KEEFER BLOCK VANCOUVER CHINATOWN CONDOS ARE COMING SOON WITH VIP PREVIEWS STARTING SHORTLY! Only a limited supply available, with just 81 modern homes are offered at the boutique Vancouver Keefer Block Chinatown apartments. Plus, the modern apartments at the Keefer Block Vancouver are priced from just $249,900*. Don’t miss out on this opportunity to own a fantastic home and investment in Historic Chinatown. *Price not including applicable taxes. Innovative European space saving design with sliding glass doors (traditional bedrooms available as well), ample built in storage solutions and spacious decks. All downtown Vancouver KEEFER FLAT homes have Italian designed kitchens, stone countertops, handset mosaic tiles and hardwood throughout. Not to mention the Keefer Flats in Downtown Vancouver have one of the coolest Murphy Beds you’ve ever seen! Here’s the H floor plan at the KEEFER Flats in Vancouver. Starting at just $249,900 for a 1 bedroom and $419,900 for a 2 bedroom, Keefer Block Vancouver represents a unique opportunity to own an irreplaceable address at an unbelievable price…. and all, minutes from downtown! Vancouver Keefer Block Homes from just $249,900 For A Limited Time Only! With homes priced under $250k as the starting pricing point, the affordable Vancouver Keefer Block condos are coming soon to the heart of the vibrant and cultural Chinatown district. Situated next to the world famous Keefer Bar and the highly acclaimed and well visited Bao Bei Restaurant, now is the time to register your interest for this new Chinatown Vancouver real estate development. The Keefer Block Vancouver condos present sleek and modern downtown homes for sale with Euro style design and quality finishes from one of the top developers in town, Solterra. 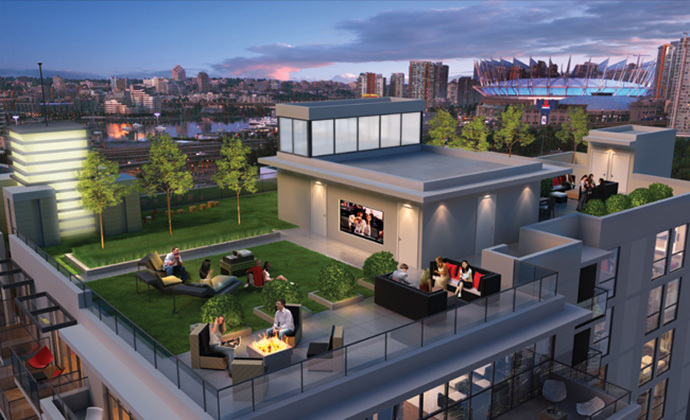 Amazing roof top lounge deck at the Keefer Block Chinatown condos will offer residents an outdoor theatre space, barbecue grilling station, fire pit, community garden plots and three hundred and sixty degree views overlooking downtown, the water and the North Shore mountains! 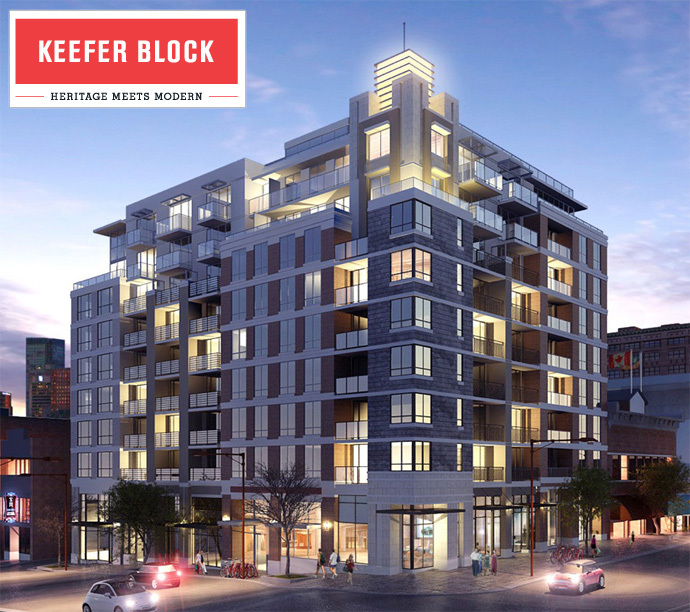 Coming soon to 189 Keefer Street Vancouver, the Keefer Block Chinatown condos for sale is here heritage meets modern. These modern apartment flats come in 1, 2 and 3 bedroom floor plans which are set to launch Fall 2012! At Main and Keefer, the new Solterra KEEFER BLOCK Vancouver condo project is one of the best Fall launches in the Vancouver real estate market! And we love it! The vibrant and urban lifestyle choices of the downtown Vancouver Chinatown district, is what makes this a unique ground level opportunity to invest in a home for the long term. This up and coming neighbourhood which has seen an influx of new trendy lounges, bars, retail stores and boutiques is now also going to be home to Solterra Developments newest project: The Keefer Block Vancouver condos for sale. The new Keefer Block Vancouver apartment building will feature only 81 suites that will combine both the traditional architecture of the Chinatown/Crosstown districts with remarkable modern designs. Not only that, but homebuyers will have a choice between 1, 2 as well as 3 bedroom Vancouver downtown condos, which is unheard of. The pre-sales for the Vancouver Keefer Block apartments is set to launch now! Located on the corner of Main and Keefer streets in historic and up-and-coming Chinatown, these 81 unique flats by Solterra will bring together traditional architecture with the best of modern design. Please note that the Chinatown Vancouver Keefer Block condos start on Level 2 and the mid-rise building is 10 stories tall. The top two floors (Levels 9 and 10) are considered to be the luxury Vancouver Keefer Block Solterra Private Collection suites. There are only a few layouts that make it onto the Keefer Block Solterra Private Collection and they include the Carrall (Plans A1 and M), the Keefer (Plan C) and the Main (Plans F1 and K). All of the floor plans at Keefer Block Vancouver condos will have outdoor living space in addition to in suite laundry. SOLTERRA INTRODUCES THE DOWNTOWN VANCOUVER KEEFER BLOCK CONDOS! Another quality Solterra development located in the heart of Chinatown Vancouver real estate district comes the Keefer Block Vancouver. Located on the corner of Main and Keefer streets in Historic Chinatown- the epicentre of cultural diversity and neighbourhood revitalization -a new community called the downtown Vancouver KEEFER BLOCK Chinatown condos emerges that juxtaposes the honest traditional architecture of the past with remarkable modern design of today. 81 Residences at THE KEEFER BLOCK Vancouver condos – 1, 2 & 3 bedrooms -will showcase the best of European finishes and design sensibility. Registration for the Vancouver downtown condos in Chinatown has begun – make sure you visit our website for priority registration! Chinatown Vancouver Apartment Residences by Solterra coming soon (now named THE KEEFER BLOCK) > Capturing the distinct vibe of Chinatown Vancouver real estate district, Solterra Development will be launching a 9 storey heritage inspired mid-rise tower anticipated to bring about 90 new Vancouver Chinatown “KEEFER BLOCK” apartment residences to the corner of Keefer Street and Main Street in downtown. As an up and coming eclectic neighbourhood, the Chinatown Vancouver real estate district has attracted many new homebuyers as well as professional singles and couples to the area over the past few years. The 189 Keefer Street Vancouver Chinatown condos by Solterra Development will be just steps away from the Sun Yat Sen Chinese Gardens, great shopping and the Keefer Hotel and Lounge, which is currently one of the hot spots for young urbanites who live in and around the downtown area. In addition, the Solterra Chinatown KEEFER BLOCK Vancouver condo development will also include great amenities such as a roof top amenity space with a theatre room and an awesome terrace deck. Centrally located, the 189 Keefer Street Vancouver KEEFER BLOCK condos by Solterra Development is a 9 storey project (mid rise) that will offer luxurious yet very affordable 1 to 3 bedroom Chinatown Vancouver condominium residences. There are only 81 suites for sale in this boutique Vancouver condo project which will also feature unique 2 bedroom plus den and 3 bedroom layouts, which is a rarity in this downtown Vancouver real estate district. 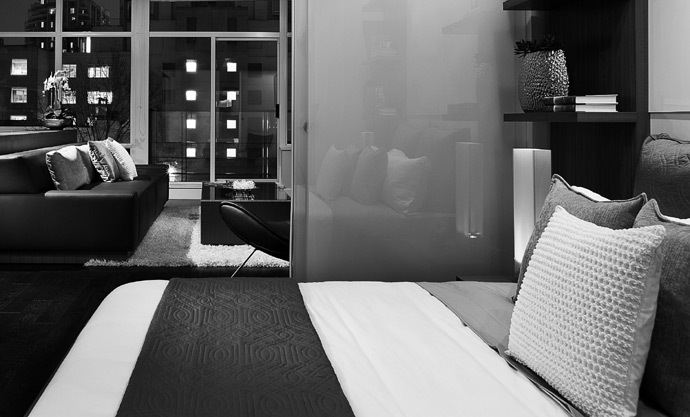 Usually, most of the Gastown and Chinatown Vancouver condos are studio suites or one bedroom layouts. With the larger floor plans, 189 condos will aim for the couples and families target market, which they should be very successful in doing so in this up and coming electrifying neighbourhood. This is one of downtown Vancouver’s most culturally engaging communities, and the Solterra KEEFER BLOCK condos at 189 Keefer Chinatown Vancouver will be situated on the same street as the ultra trendy Keefer Bar as well as The Keefer Suites which has been used in many television shows and movies such as the Housewives of Vancouver and This Means War. The 189 Keefer Vancouver KEEFER BLOCK condos will be of concrete construction and will provide panoramic views of the city facing south as well as the water and North Shore mountains to the north. Some of the incredible interior features include Italian style kitchens and European interior design finishes. This is a very rare opportunity to purchase a brand new Vancouver Chinatown condo that is centrally located and well priced.